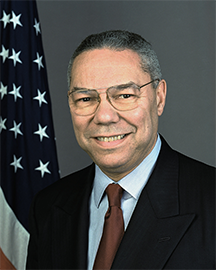 Official portrait of Colin L. Powell as the Secretary of State of the United States of America, taken in January 2001. One incident in his career serves to illustrate the full complexity of the "Hit and Run" model of career decisions. Shortly after the 2004 U.S. Presidential election, when the administration of George W. Bush was still near its zenith in popularity and confidence, Secretary Powell resigned his position. Not all resignations are examples of "Hit and Run," but some are motivated by knowledge of trouble looming in the near future. We cannot know whether Secretary Powell's decision was so motivated, but in retrospect, it is consistent with a closely related variant of "Hit and Run" that one might call "It's Your Ball," (or "Be My Guest" or "Knock Yourself Out") in its positive form, or "Jumping Ship" in a more disreputable form. Secretary Powell's well-established record of integrity suggests that if anything, his decision might best fit "It's Your Ball." Photo by U.S. Department of State courtesy Wikimedia Commons. When political operators uses toxic tactics at work, we need not respond by descending into the pit right alongside them. Responding ethically and with integrity is almost always possible, if we can detect the devious tactics early enough. Here's a collection of fairly widely used political tactics, with some suggestions for ethical, but politically savvy, responses. When someone moves on from one high profile activity to another while the current effort is still underway, he or she might have knowledge (or suspect) that the current effort is at risk or doomed. Soon afterward, the project implodes, but the operator isn't charged, and often claims that the then-current owners of the activity are at fault. If a project in your organization implodes dramatically, just after the departure of its leader or champion, investigate carefully before calling on her or him to rescue the project. Rule out "Hit and Run" before you get hit again. Sometimes an attacker's true target isn't the person who's attacked. Rather, it could be the supervisor or mentor of the person attacked. By attacking the proxy target, the attacker diverts the attention of the true target, and might even harm the true target's reputation. When attacked by someone much more powerful than yourself, don't assume that you're the true target. You could be a proxy. The harm done to you might be just as real, but knowing what's actually happening can be extremely helpful in formulating a response. When we confide in one another, the confider usually believes what is confided. That's one reason why we tend to believe what others tell us in confidence. Enhanced credibility explains, in part, why political operators sometimes tell lies — or partial truths — in confidence. And they also gain the protection of secrecy and deniability. Don't assume that confiders believe everything they tell you in confidence. Verify and validate when you can. Supervisors sometimes designate a favored subordinate who receives extra attention, multiple benefits, and who can seemingly do no wrong. Especially when this designation results from supervisor initiative — that is, when the designee hasn't curried favor — the supervisor has acknowledged and usually accepts the possibility that other subordinates will become resentful or demoralized. is at risk or doomedsubordinate has sought special status, it's likely that the supervisor's intentional choice is a signal to other subordinates that they must either accept secondary status, or move on. Because there are rarely any limits to how secondary that secondary status will be, it's probably best to move on. You lose little, though, because the favored position is usually just another form of subordination, maintained only at the price of freedom and dignity. For more devious political tactics, check out the archive Devious Political Tactics. Would you like to see your comments posted here? rbrenGDjdYpkwHnqgdVtDner@ChacLYPbPoootiAaRbXloCanyon.comSend me your comments by email, or by Web form. See also Workplace Politics, Ethics at Work, Managing Your Boss and Devious Political Tactics for more related articles. I offer email and telephone coaching at both corporate and individual rates. Contact Rick for details at rbrenEIHQtFjJkeIABzyhner@ChachelTYWEFOjzxHlTaoCanyon.com or (650) 787-6475, or toll-free in the continental US at (866) 378-5470.